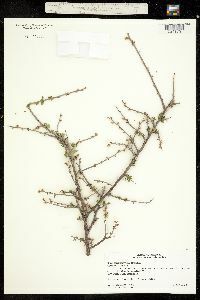 PLANT: Densely branched shrub, to 2 m tall; old bark dark gray, lenticular; branches gray, stiff and spinescent, puberulent to glabrate. 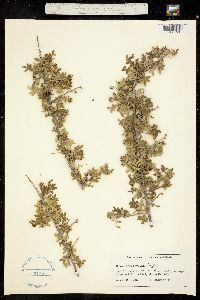 LEAVES: 12-20 mm long, deciduous, odd-pinnately compound, 5-9 foliolate, with a winged rachis; leaflets sessile, elliptic, 6-9 mm long, 2-5 mm wide, entire, hirsute. 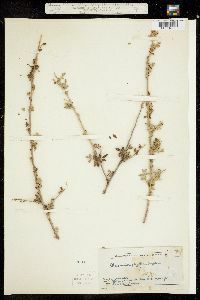 INFLORESCENCE: small, dense spikes, terminal and axillary, 8-12 mm long; bracts ovate, pubescent, to 2 mm long; flowers appearing early before or with the first leaves. FLOWERS: to 3 mm long; sepals dark pink, glabrous; petals cream, glabrous. 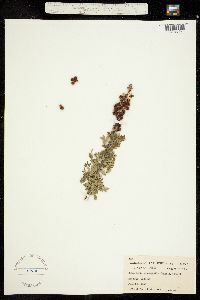 FRUIT: ovoid, 5-7 mm in diameter, dark red to orange, glandular hairy, wrinkled in dried specimens. NOTES: Gravelly mesas and rocky hillsides, often on limestone, in Chihuahuan Desert, semi-desert grassland, and oak (encinal) woodland, occasionally along dry washes and in mesquite bosques and riparian woodlands: Cochise, Graham, Greenlee, Pima, and Santa Cruz cos.; 1250-1715 m (3800-5200 ft); Mar-May; w TX and Mex to NM, AZ. In southeastern AZ, Rhus microphylla reaches the northwestern edge of its range. 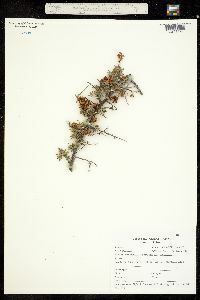 REFERENCES: John L. Anderson, 2006, Vascular Plants of Arizona: Anacardiaceae. CANOTIA 3 (2): 13-22.